Sorry for the lack of posts lately. My laptop has officially died. Right now, I’m blogging from the world’s smallest netbook, courtesy of Dave. Thankfully, I will be able to recover all the data (like all of my past blog photos, copies of past tax returns, and every picture of Liam I’ve ever taken — most of which was backed up on an external hard drive anyway), but I must find a new home for them. Anyway, I don’t have a recipe for you per se. More like a Easter Basket Cake tutorial. 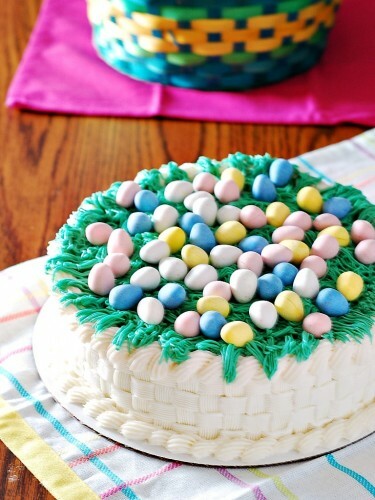 Though this cake is Easter-theme, this technique can also be used for Mother’s Day, bridal showers, or just “spring”-themed cakes. Strictly speaking, this buttercream isn’t my favorite, flavor-wise. However, it crusts quickly, making it a fabulous decorating buttercream (a far cry from Wilton’s shortening-based recipe). It looks a lot more complicated than it is. It is a bit time-consuming. But it will definitely impress your friends and family! For this cake, you will need: a cake decorating turntable; one cardboard cake circle at least two inches larger than your cake; two 8- or 9-inch cake layers (already baked and cooled); decorating buttercream (recipe at the bottom of this post); decorating bags (I used two 16-inch bags and one 12-inch; you could use three of the same size); Wilton #47 or 48 basketweave decorating tip; Wilton #21 or 22 open star decorating tip; Wilton #233 grass decorating tip; green food coloring; Easter candy (I used ¾ of a bag of Cadbury mini eggs). I also find it’s nice to have a sheet of non-skid kitchen shelf liner, to keep the cardboard circle from sliding off the cake turntable. Some turntables have a nonskid top already, so you may not need this. First, level your cakes. Most cakes “dome” while baking, and this means they won’t stack evenly. It’s very important to have a flat, even surface for this cake, so cut that dome off. Place the cake on the turntable. Place one hand in the middle of the cake layer. Hold a serrated knife parallel to the table, and slice an inch or so into the dome. Use the hand on top of the cake to turn the turntable, continuing to slice into the dome as the cake turns, until the dome comes off. Repeat with the second layer. 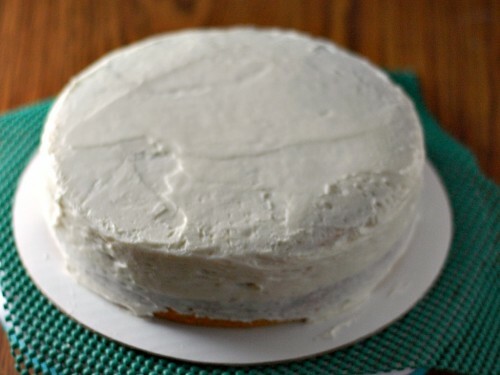 Place a dollop of icing on the cardboard cake circle, and place one cake layer in the center of the cardboard circle. Spread a thin layer of icing all over the top of the cake layer, and place the second layer, cut-side down (so the “bottom” is facing up) on top of the first layer. Now, ice the top and sides of the cake, thicker than a crumb coat, but still on the thin side. 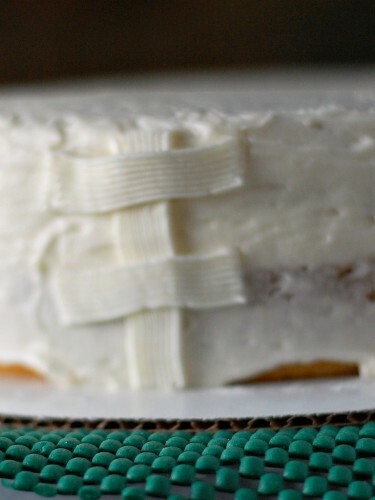 It doesn’t have to be perfectly smooth, but the entire cake should be coated. Now, place the #47 or #48 tip in the bottom of a decorating bag. Hold the bag near the point, and fold the wide end of the bag over your hand. Fill the bag half-way (ONLY half-way!) with icing. Snip off the point of the bag, just enough so the top of the decorating tip pokes through. Hold the bag so that the flat side of the tip is facing down and the serrated side is facing up. 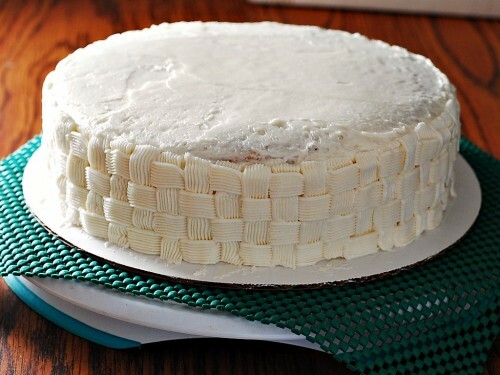 Hold the tip to the side of the cake and apply even pressure to squeeze the icing out. Pipe a line straight down from the top of the cake to the bottom. Turn the bag 90 degrees counterclockwise (to the left). At the top of the side of the cake, pipe a line perpendicular to the first, starting about a quarter of an inch to the left of the line, going over the first line, and extending about a quarter of an inch to the right of the line. Leave a gap about the width of your decorating tip, and make a second line exactly the same as the first. Now, turn the bag 90 degrees to the right (so the flat side is facing down again), and pipe a second vertical line right next to the first, going over the horizontal lines. Now, turn the back 90 degrees to the left again, and pipe two more horizontal lines, offset from the first two horizontal lines. Repeat until you’ve gone all the way around the cake. Now we’ll finish the look with a rope border. Place the open star tip (#21 or 22) in the bottom of another decorating bag, and fill no more than halfway with icing. Snip off the point. On the top outside edge of the cake, draw an “S” shape with the star tip. Now, draw an upside down “U,” starting with the tip tucked into the bottom curve of the “S,” going up over the bottom of the “S” and ending just to the right. Repeat going all around the outside edge of the cake. Repeat around the bottom of the cake. Now, we’ll make the grass. Place about a half-cup of icing in a small bowl. Place one drop of green food coloring in the icing and stir until evenly tinted. Repeat until desired shade of green is achieved. Place the #233 tip in the bottom of a small decorating bag. Fold the bag over and place the icing inside. Snip off the tip. 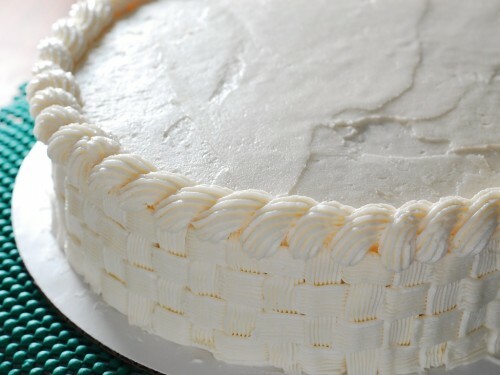 Touch the tip to the top of the cake, just inside the rope border, and use short squeezes to make “grass” that falls slightly over the rope border. Once you’ve gone all the way around the cake, squeeze the decorating bag in random patterns over the top of the cake. 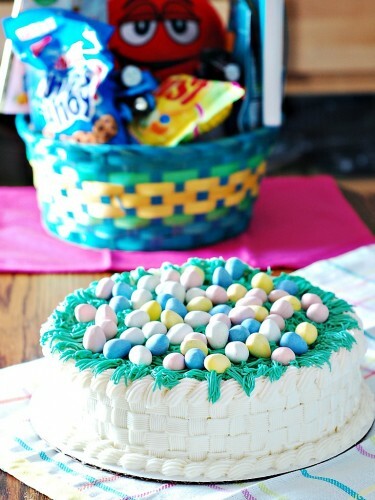 Top with Easter candy, make it as sparse or full as you like. This cake would probably be fine stored at room temperature, but I prefer to store all iced cakes in the refrigerator. Place all of the ingredients in the bowl of a stand mixer fitted with the paddle attachment. If your mixer came with a splash guard, use it. Mix on the lowest speed no more powdered sugar is visible. Increase mixer speed to medium-high, and beat for 3 to 4 minutes. 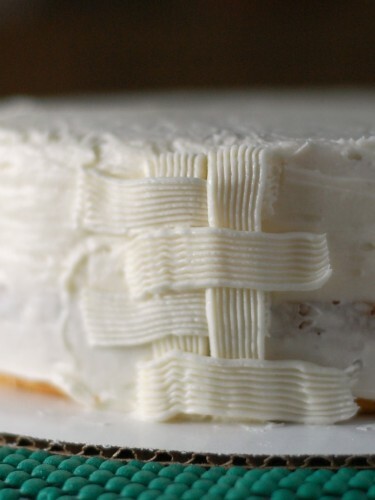 Buttercream crusts quickly, so cover with plastic wrap when not in use. Store extra buttercream in the refrigerator for up to 2 weeks. Bring to room temperature before briefly re-beating and using.